Spaulders - plate armor accessories by Steel Mastery. Milan-style pauldrons 1450-1485 years, a part of "Avant Armour"
Welcome to the section “Spaulders”. 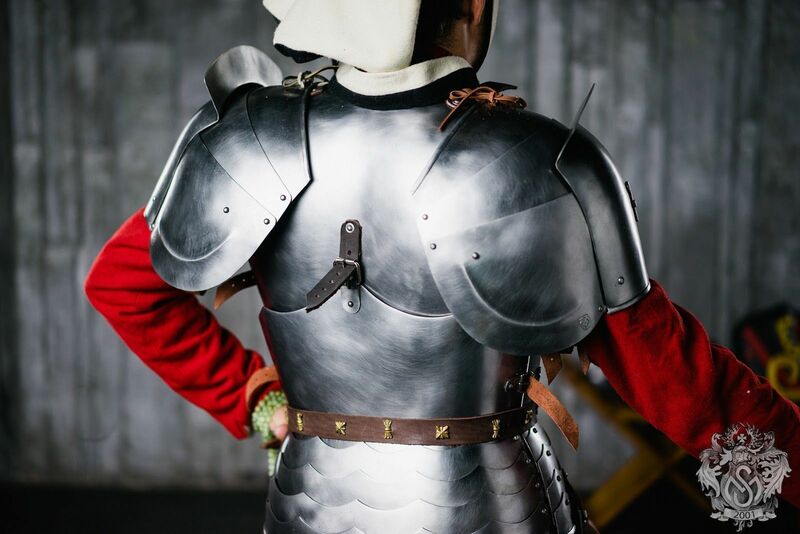 Here you’ll find different models of plate shoulder defence, which was used by European knights in the Middle Ages. We make all presented models by hands according to the individual parameters and regards of customer. Armour is based on the images of original armour, which is kept in the museums or shown in the old manuscripts. Choose satin/mirror polishing or blueing as finish treatment. If any difficulties arose, please contact our manager. We will consult you about each model. All items will perfectly complete your arm protection. All of these spaulders provide with perfect protection during medieval fencing, reenactment events, bohurts. Depending on the complement, they are compliant to the standards and rules of such social movements, as SCA (The Society for Creative Anachronism), HEMA (Historical European Martial Arts), HMB (Historical medieval battles). Once you chosen all options, please add item to the cart and make a payment. After that, manager will contact you with measurement request and specification of order’s details. If you didn’t find required element of armour in this section, we can make it individually for you. Send picture with detailed description to [email protected], so we could quote you and discuss details of order. Shoulder protection has appeared in the XIV century. In the XV, it developed to the armour of spherical shape, which completely covered a shoulder. It was called spaulder and consisted of few articulated segments. These segments hid upper part of arm, but did not hinder movements. Together with cuirass, such spaulders formed almost full body protection. Anyway, armpit stayed undefended to tilt or arrow hit. So, knights attached to this area special round plates - rondels. Some historians suggest, that Italian armourers were the first, who started to make and use such defence. Massive pauldrons of different size were typical for Milan-style shoulder protection. Thus, knight could better handle a spear with right hand. Enforced left pauldron with enlarged left elbow defence allowed stopping using of heavy shield, but at the same time to be protected of left-side hits. For extra protection, additional comb were attached to the pauldrons. It played a role of baffle plate at the direct blows. Baffle plates at the gothic-style pauldrons of the second half of the XV century were very massy. Due to their supernormal shape, such type of medieval armour gained recognizable silhouette. In distinction from Milanese armour, gothic spaulders were symmetric and had shape of shell. As other parts of this armour, spaulders had reinforcement ribs. Rondels were goffered and often decorated with etching, engraving or ornamental damascening. Shoulder defence could be attached to cuirass, steel gorget or plate arm protection. But there were also removable elements, which were fixed with lacing and leather belts. Such look of spaulders were staying till the first half of the XVII century.